Star Wars Insider – December 2018 An incredible world of Star Wars features, interviews and news awaits you in the latest issue of Star Wars Insider! 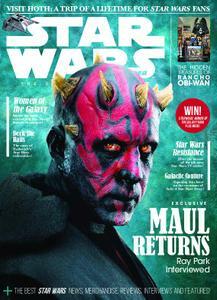 Maul actor Ray Parks reveals how he learnt about his character’s shock return in ‘Solo: A Star Wars Story’; meet the resistance as we introduce the character’s of the latest Star Wars animated series, ‘Star Wars Resistance’; and join us on a tour of Rancho Obi-Wan with owner and curator Steve Sansweet. Plus, Star Wars comics writer Kieron Gillen; a trip to Hoth a.k.a. Finse in Norwary; and much, much more!